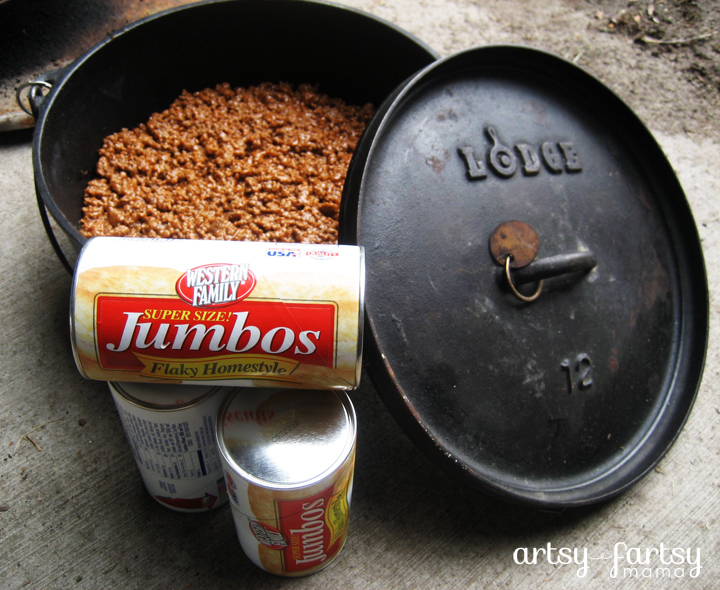 It might be getting a little too chilly to camp anymore when cooking in a Dutch Oven is perfect, but making this at home can be just as fun! Just like the title says, it's beef... and biscuits! Simple as that. 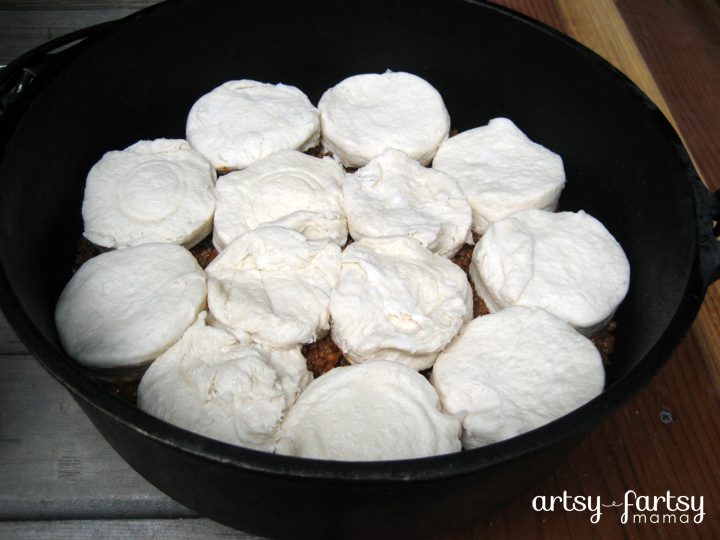 This is one of my favorite Dutch Oven recipes and one of the few that I can successfully make on my own. 1. 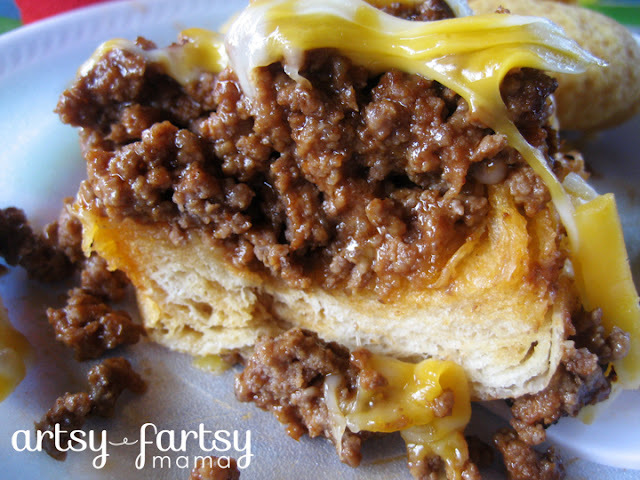 Cook the hamburger and mix up to make Sloppy Joes. 2. Pour mixture evenly into the bottom of Dutch Oven. 3. Place biscuits over the meat. I started around the outside and worked into the middle. 4. Light the charcoal when you start cooking the meat. They will be ready when they start to turn gray/white. 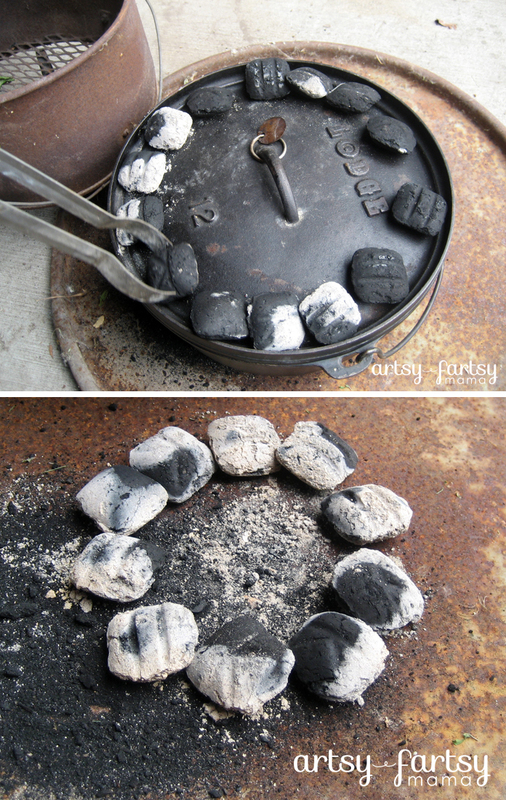 To get different temperatures, you have to place the charcoals on and above the Dutch Oven differently. You can see a guide here. For this recipe, the temperature needs to be about 350º. So, you start with 24 charcoals. The way I remember it for this is to place 12 on top, 12 on bottom. Take 2 from the bottom and move to the top, leaving 10 on the bottom and 14 on the top. Place the ones on the bottom in a close circle so they fit right under the oven. Then, place the others around the lid like in the picture above. 5. 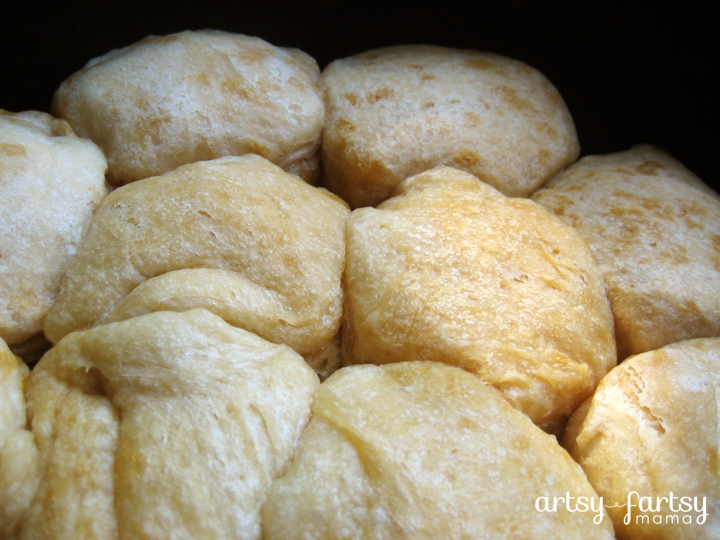 Cook for about 20-25 minutes or until the biscuits are golden brown. The meat is already cooked, so you are only waiting for them to be done. 6. Scoop out and dump on your plate! It's easier to aim for biscuit-side down since it's going to be a mess anyway. Then top with some cheddar cheese and enjoy! Prepare your sloppy joes like above. Pour sloppy joe mix evenly into a lightly greased 9x13 pan. 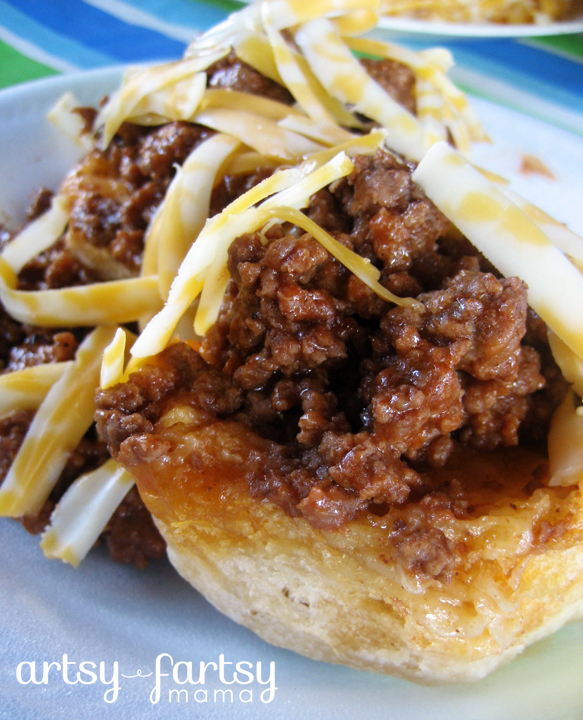 Arrange biscuits on top of sloppy joe meat. Scoop out and dump on your plate and top with cheese. Woot! I was just thinking I didn't know how to dutch oven cook! And you showed me! I am going to try this! Love, love, love Dutch Oven (unless it's 97 degrees, high humidity and I'm cooking for 200 young women campers!). This looks really yummy! What a fun dinner!!! I wish I had a dutch oven! But we'd love this anyway it's cooked! That's awesome! We love camping, and I can't wait to try this! I LOVE camping and food in a dutch oven is AMAZING! I have to add this great recipe to my dutch oven/camping recipes. A definite MUST TRY! This looks delicious! A perfect comfort food meal. Stopping by from Tasty Thursdays. Have a fabulous evening! Stop on over Thursday morning to share more of your kid friendly ideas!